I mentioned earlier that I was trying to make a metal-free jewellery gift for someone allergic to the usual metal findings. This bezelled rivoli pendant which I embellished with loops of seed beads and an inner row of picots was my starting point, but I was concerned about the metallic coating of the rivoli backing. I thought of beading a comfort strip, as I have previously made for rings, but this was too bulky. Instead I cut a little circle from a scrap of ultrasuede to fit the existing bezel, and glued this to the reverse with a tiny amount of Bond 427 adhesive. I then added another row of size 15 seed beads to conceal the edge of the ultrasuede. Really neat finish, softened the point of the rivoli, and kept the metal away from skin...result! The pendant was strung on a length of rat-tail cord with a sliding clasp of a peyote tube. Knots in the ends of the cord prevent the tube sliding off and the ends thread through in opposite directions. This finish is adjustable in length provided the tube is fairly tight and can be used for other stringing materials. 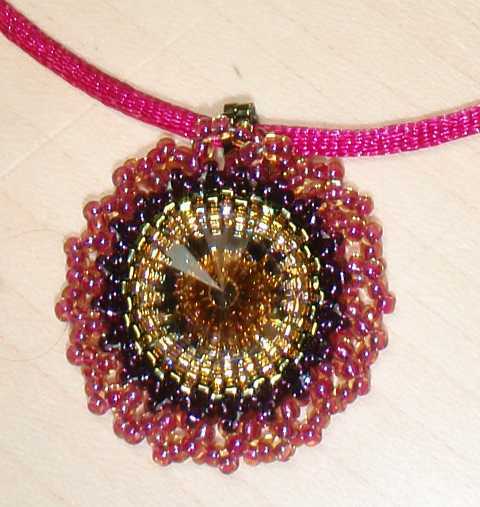 I'm indebted to Donna Sanders of Delicate Sparkles for this method, which she shared at the Bead Retreat we attended in May this year. And the recipient wore the necklace for the whole day and did not come out in a rash!